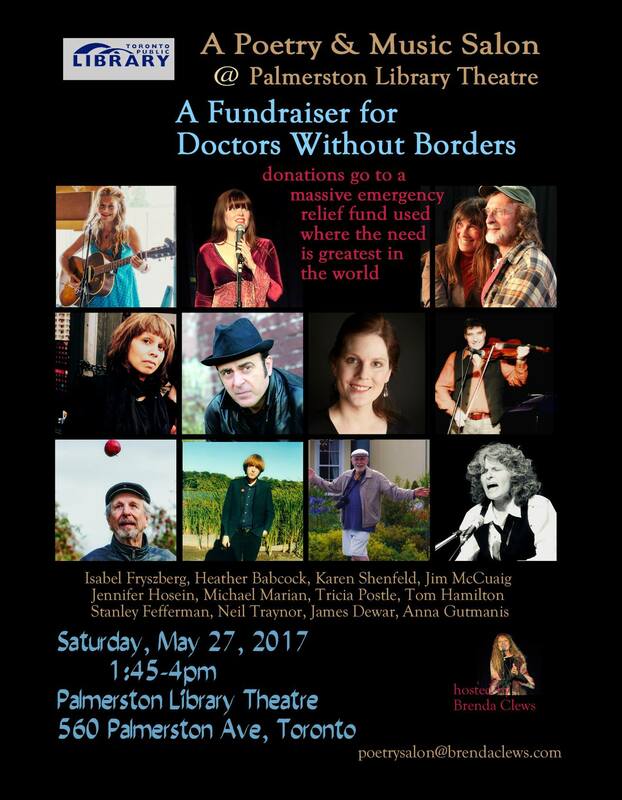 This is going to be an awesome event: A Poetry and Music Salon that is a fundraiser for Doctors Without Borders. It takes place on Saturday, May 27th from 1:45 to 4:00 p.m. at the Palmerston Library Theatre, 560 Palmerston Ave., Toronto, and features 6 poets and 6 musicians. Brenda Clews is the host, and I will be one of the featured performers, along with Isabel Fryszberg, Heather Babcock, Karen Shenfeld, Jim McCuaig, Michael Marian, Tricia Postle, Tom Hamilton, Stanley Fefferman, Neil Traynor, James Dewar, and Anna Gutmanis. I am so excited!